SACRAMENTO, Calif. (BRAIN) — Organizers say they have registered exhibitors from more countries than ever for next year's North American Handmade Bicycle Show, which will be held here Feb. 26-28. LOUISVILLE, Ky. (BRAIN) — Early-bird rates for the 2016 National Handmade Bicycle Show, offering a $100 savings on any booth space, end this Wednesday, July 15. Available booth spaces include 10x10, 10x20, 20x20 or New Builder Tables. BOULDER, Colo (BRAIN) — Next year's edition of the North American Handmade Bicycle Show will return to Sacramento, Calif., where the show was last held in 2012. The show's 12th edition will be Feb. 26-28 at the Sacramento Convention Center. LOUISVILLE, Ky. (BRAIN) — The foot of snow that fell in Louisville last week may have complicated exhibitor setup for the North American Handmade Bicycle Show, but it had little impact on show-goers, with many exhibitors saying Saturday's attendance was the busiest they've ever seen. 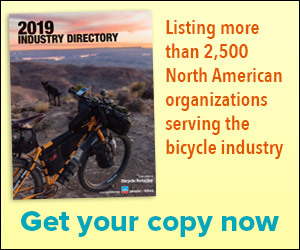 LOUISVILLE, Ky. (BRAIN) — The North American Handmade Bicycle Show announced this week that Shimano has signed on as a sponsor for next month's show. This year, Shimano is working with several bike builders to showcase the potential of their new e-bike electric assist system, Shimano Steps. CHARLOTTE, N.C. (BRAIN) — The 10th edition of the North American Handmade Bicycle Show wrapped Sunday with the naming of the Best of Show bike and the location of next year's show: Louisville, Ky.
NAHBS founder and president Don Walker, a Louisville native, said next year's show will be "huge." BOULDER, Colo. (BRAIN) — Custom framebuilder Mosaic Cycles will be auctioning a hardtail mountain bike to benefit The National Inclusion Project, a program that aims to reduce the barriers between children with disabilities and the world around them. CHARLOTTE, NC (BRAIN) — Exhibitor registration has opened for the 2014 North American Handmade Bicycle Show, which is being held March 14-16 at the Charlotte Convention Center. Cool, a “trade” show that's local, I can hit it in a day and sleep in my own bed!! Yippeee! DENVER, CO (BRAIN) — A record 200 exhibitors showed their wares at the North American Handmade Bicycle Show this weekend, and attendance was strong Friday and Saturday before being dampened somewhat by a strong snowstorm Sunday.